What a wonderful thought that these people could see God in their situation. The Lord wants you to see His hand in our own situations and circumstances. Expect the Lord to show Himself strong on your behalf. So be expectant, for as this happens, you will have reason to rejoice and celebrate. 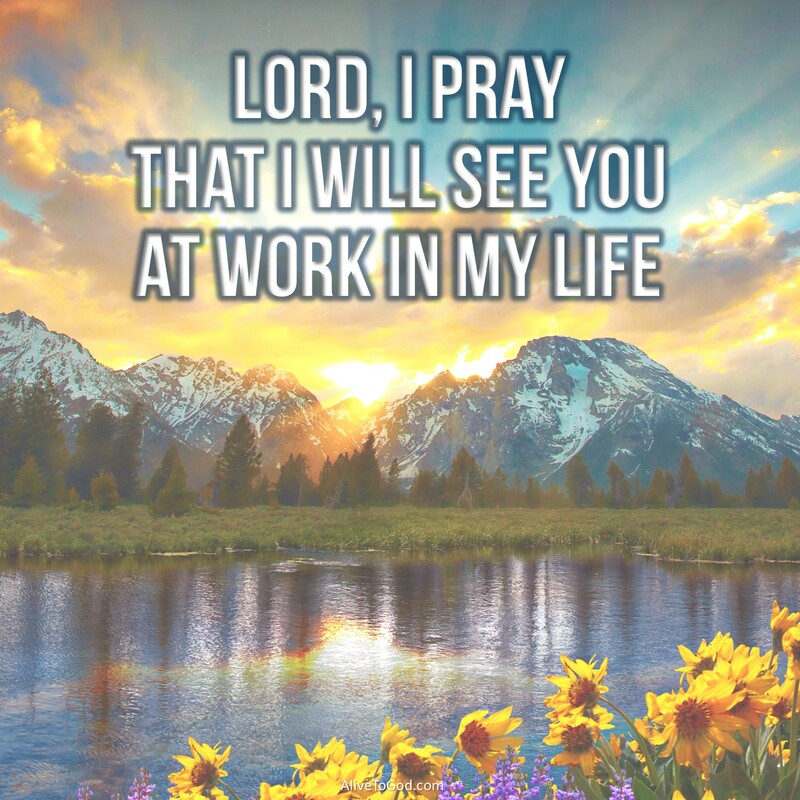 Prayer: Lord, I pray that I will see You at work in my life. You know what I am facing and going through. I trust in Your mighty working power in my heart and circumstances. Amen. Hoe wonderlik is dit nie om te dink dat hierdie mense God in hulle situasie kon sien nie. Die Here wil hê dat jy Sy hand in jou eie situasies en omstandighede moet sien. Verwag dat die Here Homself sterk sal toon om jou onthalwe. Wees dus afwagtend, want wanneer dit gebeur sal jy rede hê om te juig en fees te vier. Gebed: Here, ek bid dat ek sal sien hoe U in my lewe werk. U weet wat ek in die gesig staar en waardeur ek gaan. Ek vertrou op U magtige werkskrag in my hart en omstandighede. Amen. Qué maravilloso es pensar que esta gente pudo ver a Dios en el medio de su situación. El Señor quiere ver Su mano en nuestras situaciones y circunstancias. Puedes esperar a que el Señor se muestre fuerte a tu favor. Puedes tener la expectativa de que tendrás una razón para regocijarte y celebrar. Oración: Señor, te pido que quiero verte trabajar en mi vida. Tú sabes por lo que estoy atravesando. Confío en tu poderoso poder en mi corazón y en mis circunstancias. Amén. Quelle merveilleuse pensée de savoir que ces gens verront Dieu dans leur situation. Le Seigneur veut que tu puisses voir Sa main dans tes propres circonstances et situations. Attends-toi à ce que le Seigneur se montre fort en ta faveur. Alors sois dans l’attente, car cela se produira, et tu auras raison de te réjouir et de célébrer. Prière: Seigneur, je Te prie de Te voir à l’œuvre dans ma vie. Tu sais ce à quoi je fais face et ce que je traverse. Je fais confiance à ta Toute-puissance à l’œuvre dans mon cœur et dans mes circonstances. Amen. Napakagandang isipin na ang mga tao na ito ay nakikita ang Diyos sa kanilang kalagayan. Nais ng Panginoon na Makita mo ang kanyang mga kamay sa bawa’t pinagdadaanan natin sa ating buhay. Asahan mo na ang Panginoon ay magpakita ng matindi para sa iyo. Kaya dapat na umasa, na ito ay mangyari, at ng ikaw ay magkarason upang magpugay at magdiwang. Dasal: Panginoon, aking dasal na aking makita Ikaw at ang Iyong ginagawa sa aking buhay. Alam Mo kung ano ang aking hinarap at pinagdadaanan sa ngayon. Ako ay nagtitiwal sa Iyong makapangyarihang gawain sa aking puso at kalagayan. Amen.